LONDON, 2017-Oct-02 — /Travel PR News/ — Twin brothers who work as British Airways pilots celebrated their 60th birthdays today by walking off their last ever flights, only 30 seconds apart. 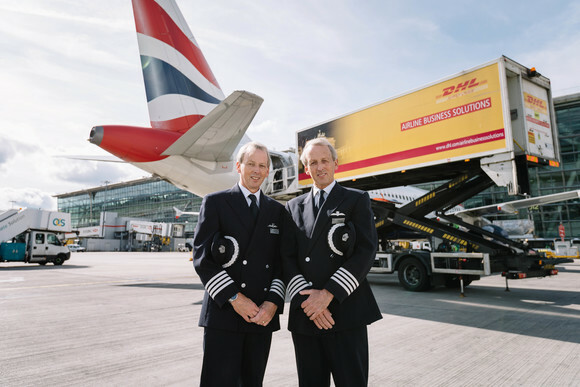 Captains Jeremy and Nick Hart both fly A320 aircraft on short-haul routes for British Airways. After being born 30 minutes apart they decided a fitting end to their flying careers would be to operate their last flights back into Heathrow on the same day, parking up their aircraft next to each other, only 30 seconds apart. Nick’s last flight from Gothenburg landed at 12.34pm while his brother, Jeremy’s last flight from Geneva landed at 12.35pm. Jeremy chose his last flight to be from Geneva as it was also the first destination he ever flew to. Jeremy joined British Airways 30 years ago in 1987. Nick joined from British Midland, which was bought by and then absorbed into British Airways in 2012. Between them, they have clocked up almost 45,000 flying hours, spent 3.5 years in the air and flown more than two million customers. The twins became interested in flying at an early age and always knew they wanted to become pilots. Their father was an English lecturer who regularly took teaching jobs around the world, so the pair grew up moving every few years and spent much of their childhood on flights to and from the Middle East and Europe. In those days of fewer security restrictions they were often allowed to sit at the back of the flight deck behind the Captain and First Officer. They both gained their private pilots’ licences before being offered places to train for their commercial licence with Britannia Airways. Jeremy took the offer from Britannia, moving to British Airways a few years later in 1987, but Nick turned it down to train with British Airways. Unfortunately, the course was cancelled, and Nick decided to go to university to study engineering. But he never lost the yearning to fly, so re-mortgaged his house to pay for flight training. Once qualified he worked for Manx Airlines in the Isle of Man before moving to British Midland and eventually British Airways. Despite working for the same airline, Nick and Jeremy have never flown together. Because both are Captains, and commanders of an aircraft, they have never been assigned to the same flight. This entry was posted in Airlines, Flights, Travel, Travel Human Resources, Travel Management, Travel Services and tagged British Airways, James Basnett, Jeremy Hart, Nick Hart, Twin brothers pilots. Bookmark the permalink.